In a previous post, I described how the Park-McCullough's Carriage Barn uses 'original green' design to work with the climate. 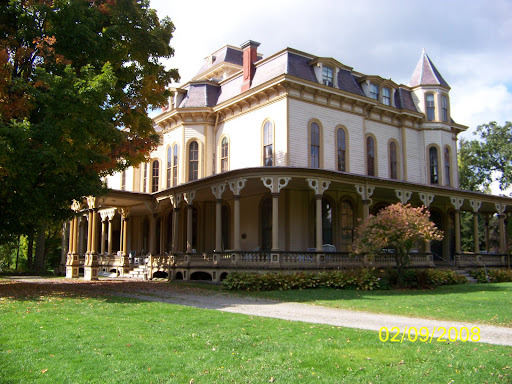 This post is about how the main house uses the same green techniques. The Big House, as the family called their summer home, has porches designed to shield the first floor from the strong summer sunshine. Large windows - 7 ft tall by 3 ft wide - are set across from each other, making cross ventilation easy. The Observatory acts as a vent at the top of the House, just the cupola does on the Barn. This photo shows how the deep porch keeps the main floor in the shade, while the master bedroom on the second floor front corner gets morning sun. 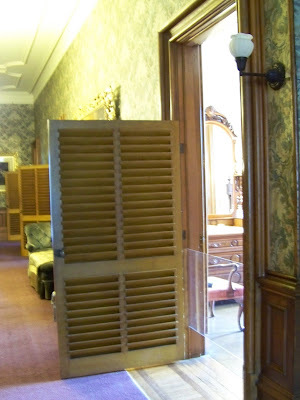 Shutters from bedrooms into the upstairs hall allow air flow across sleeping rooms and up though observatory - creating a summer breeze while preserving privacy. 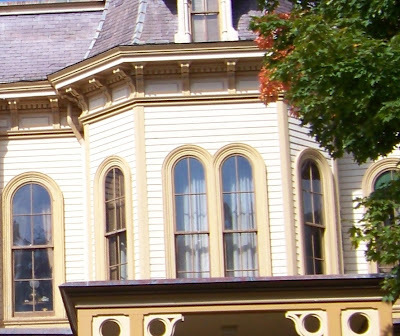 Screening for windows had not been invented when the Big House was built. The Observatory: its vents work as do those in a cupola. It is also a wonderful place to look out over the countryside. The 2 main entrances are to the south and east. The south entry is a weather entry (meaning two sets of doors that act like an air lock), and both are out of the wind. The southern entry is at the center of the photo, with the tall window allowing light into the weather entry. 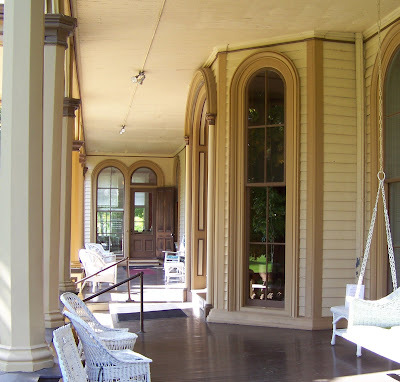 In the 1890's the family added a breakfast room (visible at the end of the porch), which is sunny all day long. Like the tack room at the Barn, there are rooms designed to be warm and bright. On the first floor the library (which became Lizzy Park McCullough's morning room) is a small room, easily heated, surrounded on three sides by the House. Similarly Laura Hall Park (Lizzy's mother) had her own room on the second floor. A beautiful room with a room-wide, floor-length bay window facing south, snugly set in the middle of the house, it has it's own fireplace. Laura did beautiful embroidery - she left some for us to admire. It is easy to imagine her sewing by the window. The south facing bay window floods Laura Hall Park's second floor morning room with light. A morning room was a Victorian lady's personal, informal space, an antidote to the formal entertaining rooms on the first floor. The layout of the House brings light and sunshine into the family space on the second floor. The main bedrooms are on the east and south sides of the House, the swing rooms to the north. The House boasted a 'modern' central heating system when it was built in 1864, but all the rooms still had coal fireplaces (some were later reworked to be wood burning). All the rooms could be closed in with doors, shutters, and heavy floor length drapes. 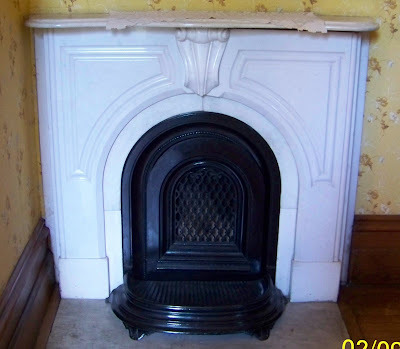 A typical bedroom fireplace with a coal insert. The open second floor sitting room dates from the 1890's renovation, after the central heating system was upgraded.